The organist and harpsichordist John Worgan (1724–90) was one of the most highly respected musicians in the London of his day: Handel admired his playing, and Burney described him as ‘very masterly and learned’. Worgan was the organist of Vauxhall Gardens and of a number of London churches and naturally composed for his own instruments. 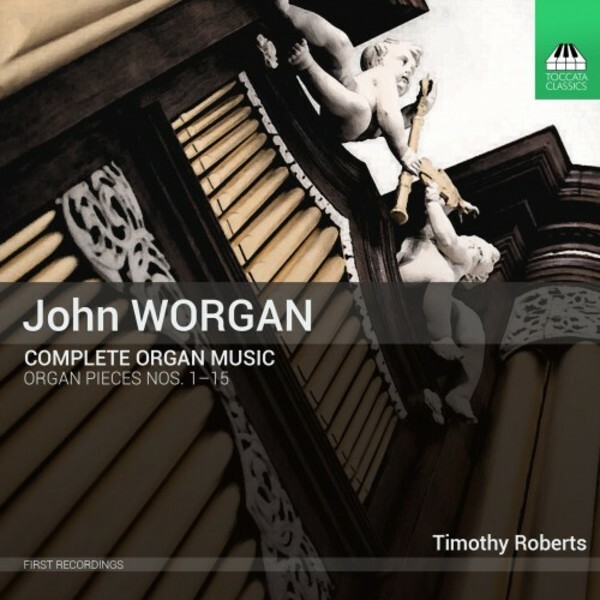 Most of his music is lost, but his fifth son, James Worgan, also a musician, had fifteen of his father’s organ pieces published after his death, and they are recorded here for the first time. In this recording they are performed on the organ of St Botolph’s without Aldgate, where Worgan himself was organist from 1753 until his demise – the perfect vehicle for this quirky but proud music. Timothy Roberts has worked as solo keyboard player specialising in harpsichord, clavichord, fortepiano and historic organs; as researcher and editor, particularly of English music of the 17th to 19th centuries; as continuo player, director, arranger, composer, music-setter, and as recording producer and editor. For twenty years he was principal keyboard of the Gabrieli Consort and Players. His editions have been published by Stainer & Bell, ABRSM, OUP, Fretwork Editions, Green Man Press and are in preparation from Toccata Press.